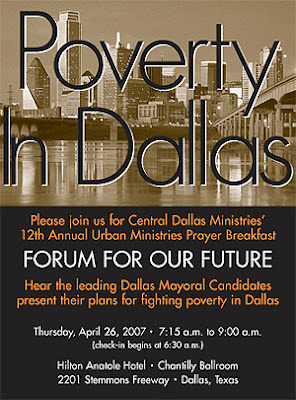 Central Dallas Ministries produced this video for use during our recent mayoral forum and prayer breakfast. It tells part of the life story of five people who have struggled with homelessness for many years. Some have been on the streets of Dallas for years. All of these people are becoming our friends, all have been regular attendees at our monthly Urban Engagement Book Club. At present, we are working to secure permanent housing for each of them. Their words are more than worth your time. Thanks to Justin Malone and Malone Media for their devotion to CDM, and for the many hours that they spent on this project. Don Imus is long gone. Maybe Rush Limbaugh should follow him. Somehow, I doubt that happens. 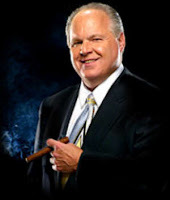 Limbaugh played this audio stream on his radio program numerous times over the past several days. Poking fun at African American political leaders, while demeaning the candidacy of Senator Barack Obama, the song's fundamental basis, intent and spirit remains thoroughly racist. The issue here has nothing to do with partisan politics, at least not to me. Will our nation ever move beyond such hateful evil? "In this world where too many are willing to see only the light that is visible, never the Light Invisible, we have a daily darkness that is night, and we encounter another darkness from time to time that is death, the deaths of those we love, but the third and most constant darkness that is with us every day, at all hours of every day, is the darkness of the mind, the pettiness and meanness and hatred, which we have invited into ourselves, and which we pay out with generous interest" (page 149). 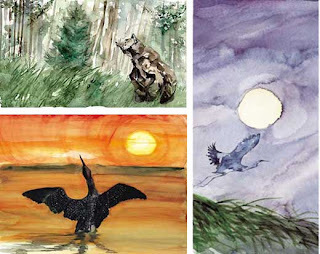 For years I've been a fan of Heron Dance, a little journal of art, poetry and reflection, and I've pointed readers here to it as a resource for reflection and beauty. In Issue 52, Roderick MacIver, artist and founder of the journal, publishes a number of quotes and selections from Ralph Waldo Emerson and Henry David Thoreau. Interlacing the quotes with beautiful water color drawings, MacIver has discovered the art of inspiration and reflection that employs the printed page. I really enjoy every issue. Everything worthwhile in life requires love, faith and imagination. Friendship, love, imagination, a spiritual life, a close connection to the natural world--all are mysterious and difficult to put into words. Art emerges out of our inner life. The processes of life co-exist with the processes of death. Good health, and life itself, are temporary. Society and its institutions are contrived realities. Expediency is valued; truth is not. Elements of a quality life: live simply, do quality work that is not rushed, avoid waste, live below your means, and keep a reserve. Set aside a substantial portion of your time for leisure. A close relationship with nature contributes joy and peace to human life. Simple living enhances our awareness of, and openness to, the beauty of the natural world. A spiritual life is a life of calmness, of openness to mystery, beauty, and infinity. Long, frequent walks in the woods bring peace and serenity to a human life. Wisdom and simplicity are closely related. The path of joy is one of knowing who you are and living it. It requires befriending yourself. Make time for silence. Adopt a thoughtful rhythm to your work and life. As I reflect on these observations, my mind moves to concerns of the city and its people. The longer I work and live here, the more convinced I am of the importance and power of beauty for everyone, including the poorest among us. Doug and I were touched by our time at the breakfast this morning. Thank you. Please tell Reverend Britt that, in our opinion, "soulless materialism laced with random acts of charity" is the best and most significant line since Bob Dylan wrote "people don't do what they believe in, they do what's most convenient - then they repent." Thanks, Mark! And, of course, Gerald's statement, as always, was brilliant and powerful! We have a lot left to do here in Dallas, don't we? Listen to Dallas Mayoral "Forum on the Future" Here! on-demand listening and via podcast. Over 1,100 people joined us for the conversation with the 7 leading candidates for Mayor. The focus of our conversation was poverty, homelessness and Southern Sector economic development. At times our conversations and debates concerning public policy leave us "stuck" in abstractions and theoretical concerns. After all, most of us here have the luxury of conversation about what are, for millions of other people, matters of life and death, literally. Just this week I received a comprehensive report from the Children's Defense Fund of Texas (CDF) on how Medicaid and the Children's Health Insurance Program (CHIP) work or, in far too many cases, don't work in Texas ("In Harm's Way: True Stories of Uninsured Texas Children"). The format of CDF's report is brilliant. Woven among the typical statistical analysis provided by such reports are the stories of real life people--men, women, children and families. These stories make the report "live." Issues addressed include matters of recertification, income limits, delays in the process, impact of the value of owned vehicles, etc. Basically, the report educates us about what consumers of these insurance products already know all too well: they are not set up to serve the most in the best manner. Attepmts to contain costs by erecting barriers to useage can prove to be deadly. The report is dedicated to the memory of Devante Johnson. Thirteen-year-old Devante Johnson had advanced kidney cancer and could not afford to be without health care coverage. But last year, that is exactly what happened, when Devante spent four desperate months uninsured while his mother tried to renew his Medicaid coverage. For years, Devante and his two younger brothers were covered by Medicaid. Texas families who qualify for Medicaid or CHIP are required to renew their coverage every six months, and Devante's mother, Tamika, had tired to get a head start by sending in her paperwork two months before Medicaid was set to expire. The application sat for six weeks until it was processed and transferred to CHIP, because an employee believed their family no longer qualified for Medicaid. At that point the paperwork got lost in the system. Tamika grew more and more desperate as she watched her son get worse. "I did everything I possibly could," Tamika said. "I would literally get off the phone in tears, crying because they [CHIP employees] frustrated me so much." For four months, Devante went without health insurance as employees unsuccessfully attempted to reinstate his coverage. As a result, he could no longer receive regular treatment and had to rely on clinical trials for care. Meanwhile, his tumors grew. Time was running out. It wasn't until a state representative intervened that Devante's coverage was immediately reinstated. Two days later, Devante was able to start a promising new treatment. But, it was too late. Devante Johnson died on March 1, 2007. The "bottom line" of the CDF report on Texas is very simple and straightforward. Every child in the state who is uninsured should be enrolled in either Medicaid or CHIP today. Making this policy decision is smart for children and for every Texas taxpayer. Beyond being smart, such a strategy is the right, just and compassionate thing to do. Prior to 1994, all of our "outreach services" to low-income people were managed, planned and delivered by volunteers who came to us from outside our community of interest. Almost all lived in the suburbs. All were middle class or above. All were white. These volunteers were, for the most part, lovely, well-intentioned people who wanted to "help people." Almost all of them showed up on their appointed days and carried out their assigned tasks with seriousness and dedication. Their aim was to relieve the need and some of the suffering of the "poor" individuals and families who came our way. They served thousands of hungry people who came expressing a need for food, housing, medical treatment, transportation, child care and jobs. The only problem was, we were not making many transformative connections to people and we weren't really engaging our community. That reality changed quickly and dramatically after we began inviting the people who sought our services to join us as leaders and volunteers in what we were doing. Today we enjoy the benefit of the intelligence, insight and energy of hundreds of volunteers who could be categorized as "poor" or low-income. These unusual volunteers have served as a consistent "think tank," providing us wise counsel and direction on a series of "next steps" that we have taken over the past 13 years. They remain an amazing strategic resource for our entire organization. Most important of all, these folks are our partners, peers and friends. The manner in which we use volunteers and the way in which we regard "the poor," create a few challenges for us as we attempt to satisfy the demand of our more affluent partners from churches outside our community who want to "come down and help us out." We want volunteers from outside the community to join us and to engage our process and become our partners, allies and friends. When it comes to "the help" part, we need to talk. It is not easy to explain our day-to-day reality, as well as the nature of our needs and our assets, to people who aren't here all of the time, but who face the challenge of arranging meaningful volunteer opportunities for their church members. We need to craft an approach that takes seriously both our leadership style and our mission, and the need churches recognize for transforming experiences for their members. With this duality in full view, I'll offer a few observations, mingled with suggestions, about inner city community development work and suburban volunteer projects. 1) It is clear to me that in-out "missions" are limited in their affect on the community. While project-based experiences serve a vital purpose for church leaders and the volunteers with whom they work, most enjoy, at best, short-term gains for the community. A clean up project, a day in the food pantry, an afternoon spent playing with children and any number of other time-limited projects benefit the volunteers more than the community. Let me hasten to add, this can be fine, so long as the community and its members are not injured or misled in the process. We want to meet the needs of our outside partners, but not at the expense of disappointed children or adults who misunderstand what outside volunteer presence means for the longer term. I think it wise of church leaders to educate their volunteers about who benefits most from such short-term projects. Across the years, I've noticed that volunteers who recognize that they actually benefit most, approach their assignments with the proper attitude and perspective. 2) When you come, please come on our terms. In our large Resource Center on Haskell Avenue, community volunteers "run the show." For many outside volunteers an experience in this community center will be a first. "Poor folks" are in charge. They set the policy, organize the assignments and provide direction. The entire place is set up so that everyone listens to the community. From time to time, we have volunteers who don't understand that. It helps to recognize who is in charge. 3) Apply the "Golden Rule,"but in a surprising manner. Let me ask you, how do you feel when you are served by someone else? Most of us don't really like the feeling. We resist. We attempt to turn away the person seeking to do us good. It takes humility to receive gifts and service and "help," doesn't it? Volunteers from outside the community need to apply Jesus' advice, "Do unto others as you would have them do unto you," but in a different way. They need to put themselves in the place of a person in need and consider carefully how they would want to be treated if the roles were reversed. This always leads to careful listening, honest communication and genuine human sharing. Jesus also said, "It is more blessed to give than to receive." This means that the highest good is to place another person in a position where he or she can give. This is the theology back of our decision to invite the poor to become givers. In such a setting of "role reversal," our need for "help" changes dramatically. Volunteers need to grapple with this new point of view before they come. 4) Understand what we are trying to do here. We really are disgusted by the need that persists in a city like Dallas. We are trying to change not only individual lives, but the system that keeps poverty in place. We are not primarily about relief. We seek to be into understanding. We want to influence policy. We want to get to know each other. We are all about making connections that endure and that take us all to a new place. This is the primary reason I believe that volunteers need to "hang out" at CDM. It is not so much "to help," as it is to know and understand. 5) Before you come as a volunteer personally or before you organize a group of volunteers who want to come, ask yourselves "What happens when the project is over?" Will the needs go on? Will expectations be raised? Will anyone be left looking for your return? What will the relationships established during your time with us mean for the future? Is there anything else that should naturally occur because of the connections you make during your volunteer experience? 6) Please understand, almost always, we don't need your stuff. There certainly are exceptions to this principle. When we need something though, we will ask you for it upfront! Recently, a great church group provided work boots and work pants for the 22 graduates of our construction training program. Another church provided new shirts for these same students for their graduation celebration. These donations really helped us. The recipients were very grateful. But, usually, we don't need volunteers to shower us with things. That sends the wrong message in every direction about what's important. We don't need our children to become dependent on the sometimes caviler largess of outsiders. We are working hard to create an independence within our communities. Here again, we need volunteer/outsider buy in to our vision for our own community and its improved health. 7) Charity has a dark side that most charitable people never consider. Charity can be a rather sophisticated means for people with economic, social and political power to maintain control of their power. After all, if I believe that charity is the only and best response to poverty and its myriad problems, I don't need to trouble myself much with asking why so many people are poor? Or, what should be changed from a policy standpoint to see that fewer of my neighbors become and remain poor? We hope to move beyond charity to community development, empowerment and change. Charity alone will never get us there. 8) Can we simply commit to continue talking about the complexities of these issues? If we make this commitment, I know we will make progress for everyone. Frankly, I think we need on-going dialogue rather than another needs assessment. I'd love to hear from you. We can start talking whenever you're ready! A chance to work and make a life. . .
Last Friday, I attended the graduation of our current WorkPaths class. 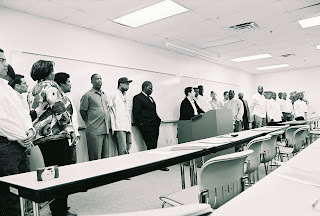 Teachers, family members and friends gathered to honor and to celebrate the accomplishments of twenty-two dedicated students who completed the arduous 12-week course that provided training in a full range of basic construction skills with an emphasis on hazardous waste and Brownfield remediation. The training was challenging, rewarding and promising. Thanks to Andrea Bills, our program director, to Gerald Britt who provides leadership and vision for all of our Community Development Programs and to numerous staff members from several departments who are continually supportive of this part of our work. As each of the students walked forward to receive their hard-won certificates, we could not contain our applause. What a celebration! This week the students will return to the training center to meet with a number of contracting companies to interview for jobs that will pay them a livable wage and set them on a path for personal growth and the realization of better lives for themselves and their families. The eagerness and excitement over their new found opportunity could not be contained. As I watched and listened, I realized I was observing a process that needs to be repeated thousands of times across the nation. Skill set development provides a pathway out of poverty. As communities, we must find ways to fund and deliver this sort of training to every man and woman who wants to do better with work and earning. CDM provides this training (this was our second class to complete the course) thanks to funding from the National Institute of Environmental Health Science. Our other partners were OAI, North Lake College/Dallas County Community College District, Construction Education Foundation of North Texas, and JPMorganChase. The class members formed an amazing group. Most were very young men. One was a middle aged woman that everyone referred to as "Momma" by the end of class. 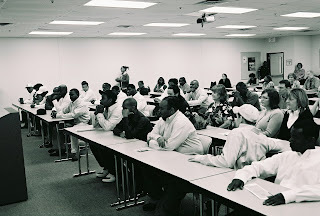 Many had been incarcerated in Texas prisons in a past life--ex-offenders. 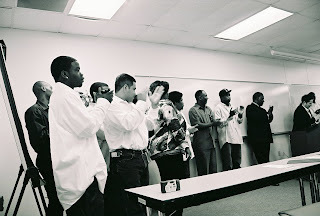 One was homeless, recruited to the class while attending one of our Urban Engagement Book Club meetings! All had learned the benefit and the necessity of helping each other as a team or community in the learning process. The graduation celebration spoke volumes about hope, achievement and visions for better tomorrows! I was more than honored to be in the room. They're at it again in Austin. You can read all about it in yesterday's edition of The Dallas Morning News ( "One State Under God," by Karen Brooks, A1, Sunday, April 22, 2007). 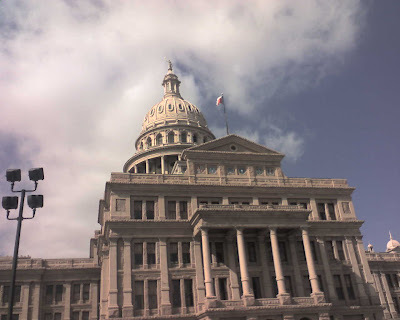 Defending God and "His values" can be tough work in such a secular place as Texas and in such a "godless environment" as the halls of our state house, right? Serious business protecting the "In God We Trust" and "under God" heritage of the Lone Star state. But, never fear, God's cause has lots of help from lots of courageous warriors this session! Why, this session has produced bills dealing with offering Bible classes and prayer in public schools and declarations of the state's faith in public places. On more than one occasion, members of the legislature have risen to proclaim and affirm Texas' unshakable commitment to Judeo-Christian values, while, on at least one occasion, protesting the involvement of a Muslim cleric who had been invited to offer a prayer in the Senate chamber. I always find these debates and such efforts curious and a bit amusing. Curious, because the lawmakers shouting the loudest for keeping God and the values of our Judeo-Christian heritage at the center of the public square are also those most opposed to extending justice, opportunity and assistance to the poor, the weak and the marginalized--actions and policies that are central hallmarks of the faith of both Jews and Christians through the centuries (as in "Judeo-Christian values"). Any careful study of the voting records of many of our legislators comparing their stances on "values issues" with their votes on major, social policy matters, such as the Children's Health Insurance Program (CHIP) or Medicaid or prison reform or any number of Health and Human Services issues, undoubtedly would reveal an inverse correlation. Amusing, because those making the most noise for God don't seem to know what God cares about most. Here's one for the books. One bill introduced in this session would ban chemical dependency treatment clinics within 1,000 feet of a church. The same bill bans prostitution within that same distance from a house of worship. Hmmmm. Maybe I misunderstood the real meaning and purpose of faith, the Torah and the Gospel. Who is protecting who from whom? Such a bill would make it less convenient for church goers to visit their family members recovering in such facilities! As for prostitution, I thought that was against the law in Texas already? And, never mind that Jesus would have welcomed such women to his table and inside his band of merry disciples. And by the way, why wouldn't a church consider housing a drug treatment center? Of course, politicians simply reflect the will and worldview of their constituents. And that is the problem. It's not the legislators that are the main issue--though a bit of independent leadership would be refreshing. Here's the issue: Somehow lots of church folks have missed the major point of the faith. Throughout the Bible, it is very clear that caring for the poor, the weak, the alien and the oppressed is much more important to God, and those who speak for God, than are personal expressions of religious devotion. In fact, according the Bible, such expressions of faith are always considered hypocritical and counterproductive in view of how the poor are treated by people who claim to be devoted to God. In view of the clear ethical and moral priorities of the holy writings of Judaism and Christianity, and considering the nature and opportunities afforded us in our constitutional democracy, every value proposition related to personal piety and religious devotion would be best left to individuals to apply as conscience directs. At the same time, those values relating to the quality of life we craft together as a state community should be worked out in the public square to the benefit of the weakest and most needy among us. Such would be the response of a faith-filled state. People of faith are not called to fight the world or withdraw from it or shut it out or despise it. My faith tells me we are called to love it, serve it and welcome it to a God of love, light, hope and joy. In my view, when people of faith walk in the way of the faith, there will be no need for publicly endorsed prayers, school-sponsored Bible study (unless it is as literature) or religious statements etched in stone or carved in wood. Our lives will be our sermons and everyone we seek to influence will hear us loud and clear without even a word being uttered. The more I read after Shane Claiborne, the more he inspires, troubles, challenges and motivates me to rethink just about everything! Here are quotes from chapter 9 ("Jesus is for losers") of his remarkable The Irresistible Revolution: living as an ordinary radical (pages 264-266, 2006) that speak to the importance of how we "see" other people. Really important stuff, especially in the city. When we look through the eyes of Jesus, we see new things in people. In the murderers, we see our own hatred. In the addicts, we see our own addictions. In the saints, we catch glimpses of our own holiness. We can see our own brokenness, our own violence, our own ability to destroy, and we can see our own sacredness, our own capacity to love and forgive. When we realize that we are both wretched and beautiful, we are freed up to see others the same way. . . . I have on old hippie friend who loves Jesus and smokes a lot of weed, and he's always trying to get under my skin and stir up a debate, especially when I have innocent young Christians visiting with me. (The problem is that he knows the Bible better than most of them do.) One day, he said to me, "Jesus never talked to a prostitute.” I immediately went on the offensive: "Oh, sure he did," and whipped out my sword of the Spirit [Bible] and got ready to spar. Then he just calmly looked me in the eye and said, "Listen, Jesus never talked to a prostitute because he didn't see a prostitute. He just saw a child of God he was madly in love with." I lost the debate that night. When we have new eyes, we can look into the eyes of those we don't even like and see the One we love. We can see God's image in everyone we encounter. As Henri Nouwen puts it, "In the face of the oppressed I recognize my own face, and in the hands of the oppressor I recognize my own hands. Their flesh is my flesh, their blood is my blood, their pain is my pain, their smile is my smile" (With Open Hands, 1987, page 46). We are made of the same dust. We cry the same tears. No one is beyond redemption. And we are free to imagine a revolution that sets both the oppressed and the oppressors free. Author of 25 books, at least by my count, including Slaughterhouse-Five, Jailbird and God Bless you, Dr. Kevorkian, Vonnegut's last book, A Man Without a Country, turned out to be thoroughly autobiographical. I read it while on a plane a couple of weeks ago. Typically, it tends toward the profane at points. If you can live with that, it is worth reading, even if you don't agree with him and I expect some readers here will find much with which to differ! But, that's okay, isn't it? Only reading what confirms my bias is not healthy. I found it hilarious at points (what does that say about me???). And, I agreed with his consistent emphasis on kindness and the "Golden Rule." Here's just a snippet to give you a feel for his direction. Quoting Eugene V. Debs as he begins. . .
"'As long as there is a lower class, I am in it. As long as there is a criminal element, I'm of it. As long as there is a soul in prison, I am not free.' . 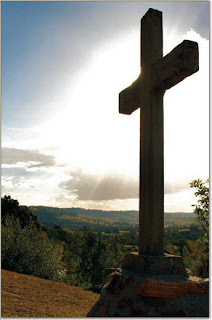 . .
"How about Jesus' Sermon on the Mount, the Beatitudes?. . .
"'Blessed are the merciful,' in a courtroom? 'Blessed are the peacemakers in the Pentagon? Give me a break!" (pages 96-98). "But if Christ hadn't delivered the Sermon on the Mount, with its language of mercy and pity, I wouldn't want to be a human being. Rev. Gerald Britt serves as Vice President of Public Policy and Community Program Development here at Central Dallas Ministries. On Saturday, March 3, 2007, Gerald spoke to the Connections 2007 Child and Adolescent Advocacy Conference, an annual event in Dallas sponsored by the Women's Council of Dallas County and Children's Medical Center. Gerald entitled his speech, "Nourishing Our Children." I think you will benefit from reading it. There once was a sociology professor who, when taking his afternoon constitutional, came upon a young mother spanking her child in the front yard. He stopped at once and patiently, but firmly, confronted the young woman. "You must not spank your child," he said, "you will traumatize him. You must love them." That weekend, the professor was working on his driveway, spreading new cement. Suddenly, this young woman’s son and some of his friends ran through his yards and ran right through the fresh cement. The professor angrily ran after them, shouting and threatening to give them a good spanking. The young woman saw this happen and said, "Professor, I thought we were to love our children not spank them." To which the professor replied, "I love children in the abstract, but not in the concrete!" This is why we are here today. We represent, care for and work with families and communities, whose interests are in the plight of our children, children whose futures must be considered uncertain at best and bleak at the very worst. According to the Center for Public Policy Priorities in Austin, 17.8% of children under the age of 18, live in poverty across the U.S. In Texas, 23.2% of those of the same age range are living in households that qualify as poor. That means that 23% of our children are in families struggling to make it on $20,000 a year in a family of four, according to 2006 Federal Poverty Guidelines. Precious little could be more shameful. Our challenge is to change the nature of conversation regarding children, from abstract political rhetoric, to aggressive, creative, substantive public policy proposals and recommendations that will lead to the reforms that will result in better health care, education and job opportunities for parents now and for children if they or we, for that matter, are to have a real future. These are our children, and we can no longer afford to love them in the abstract. Our children are the embodiment of our hopes and dreams. They are the beneficiaries of our legacies and the heritage of our families and communities. We want these children to have lives that are healthy, happy and whole. Truly nurturing children means that we provide them with the hope that comes through being educated. When I say educated, I mean really educated. We are not educating children by teaching them to be proficient test takers. We are not educating children when we don’t expose them to art and music at a young age. We are not educating them when we don’t teach them to appreciate, learn from and apply the lessons to be learned in great literature and history. And we can never teach them if we do not believe they can learn, and learn at high levels. Children living in low-income neighborhoods experience unequal access to quality education compared to children who live in higher income neighborhoods. In Texas where property taxes help fund public school districts, children who attend public school in low-income communities have fewer dollars per student spent on them than public schools in higher income communities. Disparities in school funding lead to inequalities of available resources across school districts, including up to date text books; science-lab equipment, computer, music, and sports equipment; field trips and other extracurricular activities, taken for granted in wealthier communities. We cannot nurture children if they are not healthy. Our children swing between obesity and food insecurity. In our most distressed neighborhoods, choice, affordability and transportation are issues, even when it comes to food. Grocery stores that sell wholesome, nutritional food at affordable prices are in scarce supply, while cheap fast food choices are stacked upon one another leaving encouraging diets that consist of fried fish, fried chicken, barbecue and hamburgers, along with assorted chips and soft drinks. We cannot nourish our children, if we don’t nourish them physically. Implementing a ‘testocracy’ in our schools has taken away things like gym class and recess. The absence of safe parks and the presence of crime, the overpopulation of stray animals, and poorly equipped recreation centers, leave our children few options when it comes to creatively occupying themselves. We cannot nourish our children if we do not tend to their overall health. Regular immunizations, doctor check ups, dental hygiene are all problems for the poor. Without health insurance, CHIP or MEDICAID, the most routine health care problems are brought to the primary care physician of last resort: the emergency room doctor. But most importantly, we cannot nourish children, unless we provide opportunity for their parents. While Leave No Child Behind is being acknowledged as a relatively effective strategy for successful public education, we are forgetting that if we leave parents behind, we place every child at risk of being left behind. While poverty itself may not cause negative outcomes in children, it often co-occurs with many stressors that may be harmful: stressors such as single parenthood, four or more children in that child’s household, and the lack of a high school diploma or GED by the child’s parent. One study found that only 22% of poor children experienced poverty with no other risk factors (the aforementioned ‘stressors’). About half experienced poverty plus one other risk factor; almost a quarter experienced poverty plus two other risk factors; and 5% experienced all the risk factors. Negative outcomes associated with poverty, plus two or more of these risk factors, include behavioral and emotional problems and problems in school. Among children ages 6-11, 18% of those who were considered at high risk (exhibiting three or more risk factors) also exhibited a high level of behavioral problems (compared to 6% of other children), and 32% exhibited low school engagement (compared to 14% of other children). We cannot even think of eliminating poverty among children, apart from what we do for the adults in the households in which they live. ·One third of Texas families are classified as low income and 41% of Texas workers work at jobs that pay a median hourly wage of $10 or less. ·The Lone Star State ranks close to the bottom in providing essential support services such as affordable health care and adult education. ·Our state has over 53% of low income families with at least one adult without health insurance. There is no such thing as rich children growing up in a home of poor adults. Adult poverty impedes the cognitive development of children and their ability to learn. It contributes to behavioral, social and emotional problems. It can lead to poor health as well. Research tells us that the risks posed by poverty are greatest among children who experience poverty when they are young and among children who experience persistent deep poverty. And so, our challenge is to nurture our children by beginning a "pro-quality-of-life" movement. This is a movement which seeks to make textbooks more available to our children than guns; this is a movement that seeks to make well-balanced meals more the norm for our children than drugs and alcohol; this is a movement that wants to make early childhood development programs and after-school enrichment more accessible than opportunities for mischief and crime. This is the movement that wants to improve and build more public schools, colleges and universities, than prisons. This is a movement that wants jobs that pay a living wage, so that parents can model dignity and self-worth as they provide for their children. This "pro-quality-of-life" movement spans the length and breadth of our cities and communities. And it must be based on the understanding that if all children don’t have a future, none of us has a future. In one of my favorite Peanuts cartoons, Lucy demands that Linus change TV channels and then threatens him with her fist if he doesn’t. "What makes you think you can walk right over her and take over?" asks Linus. "These five fingers," says Lucy. "Individually, they’re nothing, but when I curl them together like this into a single unit, they form a weapon that is terrible to behold." "Which channel do you want?" asks Linus. Turning away, he looks at his fingers and says, "Why can’t you guys get organized like that?" The only way that we are going to change the political channel to which Texas is tuned, is for us to organize. Politicians and public officials must see advocates for Texas children that look like Texas. Texas is Black, white and brown. Texas is affluent, middle class and poor. Texas is North Dallas, Plano and South Dallas. It is Houston’s Fifth Ward, the East Side of San Antonio and the Colonias. If legislation is not passed that it is good for all of us, then it is not good for any of us. The voice of the "pro-quality-of-life" movement must be heard. It must be heard if ours is to be a true democracy. It must be heard if people in distressed and blighted communities are to have hope. It must be heard if our children are truly to be educated. It must be heard if third world islands are not to be permitted in the midst of the great waters of our large urban centers. This voice must be heard if "justice is to run like waters, and righteousness like a mighty stream." This voice must be heard if our children are to be nurtured and their very lives are to be rescued from marginalization and the annihilation of poverty and despair. How affluent churches can partner with inner city communities. . .
Not long ago I spoke to a church located in a well-to-do part of Dallas. Great folks who are eager to do good things, serve people and make a difference in our city. The minister had invited me to speak to the group about faith, biblical theology and "the poor," which I was happy to do. About a week later, I received an e-mail message form the minister thanking me for being with the church and suggesting that I return at some point in the near future to address a topic something like, “10 practical things I can do to seek justice and do compassion.” I like that! I responded that I would love that assignment, and I expect we will work on that in the next few weeks. Recently, another friend and minister was discussing the same subject, how it is that suburban or exurban congregations of material means can best assist urban ministries and low-income, inner city communities like ours. One statement he made summed up well a sentiment that I've heard often from the leaders of such faith groups: "We’re going to need some specific guidance to get people engaged before we’re able to get money engaged. . . ."
Many people of faith, who don't reside in depressed and challenged neighborhoods, want to help in a "hands on" way. They want to volunteer. They want to be involved in the experience of the "community of need." Many also want to know what is going on and what is being done "on the ground," so to speak. Such involvement for lots of people is a prerequisite for providing financial assistance. I think I understand this need donors have. Over the years I couldn't count the number of people who have told me, "Larry, no problem is ever solved by 'throwing money' at it!" Again, while I do understand this point of view, I must quickly add that I haven't seen anyone "throwing money" at the problems we attempt to address every day! The entire matter gets very complicated. Rich (or at least, relatively rich) people want to do more than give money. I will give them the benefit of the doubt that their money is something they will eventually give! Lots of people give nothing, no matter what. Further, like my friends at the first church I mentioned, folks with means want to know practical steps they can take to help beyond writing a check. On the other hand, poor people genuinely desire to help themselves and make whatever contributions of time, talent, sweat equity and even money to address the problems facing their families and their neighborhoods. This is why we utilize the gifts and energies of so many low-income persons. As a result, we need very few volunteers , which can be a "turn off" at times to our more affluent friends and partners in churches. Then, there is our mission. We are here to build community and to stand alongside poor folks to see them take responsibility for improving their own lives, environments and living conditions. What do poor folks and organizations like ours need most from the more affluent? That's not rocket science. We need funds, financial support and a sustainable commitment to back our work. In most cases, when a person with financial capacity asks me what is the best way to help me and CDM, I say something like, "Did you bring your checkbook?" That is just the honest truth. We have a plan. We have great people and an amazing team. We have a strategy and, most importantly, we are working with the poor as peers and partners. We have lots of hands and they are engaged, really "on," if you will! What we don't have is enough funding to address the problems that we know well. That is just reality. Our philosophy dictates that the role of outside volunteers will always be minimal compared to the role required by the people who reside in the challenged communities. To be sure, there will be many meaningful ways for outsiders with wealth to be involved as volunteers. And, we will always welcome outsiders who want to be among us to make new friends, help with the work we are doing and better understand our city. But, a strategy to engage the involvement of outside volunteers cannot become the primary driving force behind our mission or strategy. The day that becomes the case will be the day our effectiveness in community building and development will end. Our mission here is not charity. We are moving beyond charity to human and community development. Our mission requires partners of material means who will surrender control of their dollars to those facing daunting problems needing a solution. This will always be among the highest and best contributions outside groups can offer the inner city. Of course, it takes real faith to give on these terms. More on this subject later. . . .
Cho Seung-Hui, the gunman who snuffed out 32 promising young lives before taking his own in a fit of insane violence Monday at Virginia Tech, is now being described by university officials and fellow students as "a loner." No doubt, this story has many dimensions and will turn out to be complex beyond complete understanding. Already we are learning of his anger, violent writing and bizarre social behavior. Obviously, this young man was extremely troubled and in need of specialized professional attention. One observation about him stands out to me. The purpose of community building and community development is to see that everyone has a chance to be connected in a meaningful, enduring manner to at least a few other people. From what I'm reading and hearing, Cho Seung-Hui had many opportunities to realize a connection to the Virginia Tech community, but he was too unstable and disturbed to take advantage of these options. The results, of course, have been beyond tragic. We continue to grieve with the entire university community. It works that way among people who know and understand the power and importance of human connectedness. A blow to one strong community can be felt by others who enjoy and are working on building community together. Building community must remain our clear mission, informing everything we do in the city. Our work cannot be just about charity or compassion or "helping" people. It cannot be fundamentally about providing people volunteer opportunities. The basis of what we seek to accomplish is fundamentally not about feeding people, housing people, healing people or educating people. While we may decide to use activities like these to do part of our work, and while such actions often will prove necessary, our goal must always be to connect people to one another for improved well being and for the experience of authentic, human community. Our call is to eliminate "loners." We aim to omit isolation. The entire Virginia Tech community fills my mind and heart this morning. The inexplicable massacre that took place in Blacksburg yesterday morning defies comprehension. Thirty-three deaths, including the gunman who took his own life, and many injuries. . . .
Why murder completely innocent people? One of the weapons used in the disaster was purchased just last week. Obviously, the shooter, apparently a Virginia Tech student, was deranged, apparently troubled over a failed relationship. Did he have no friends? No support? No community? There are no answers. I expect that for many questions there will never be answers. Identifying with the students and their families comes easy this morning. I've been thinking of my own children and my grandchildren. Classroom and universities should be places of hope and opportunity and freedom, not chained chambers of death. Devastating. Pray for the community at Virginia Tech today. Pray for the students who were injured. Pray for the families who lost children and brothers and sisters. Pray for hope to survive in every life. Pray for your community and every member of it. The statement Don Imus made recently about the Rutgers women's basketball team was thoroughly racist and sexist. He was trying to be funny. For me, the debate about whether or not Imus is a racist misses a much more important and sobering point. To be sure, Imus sounded racist and sexist. His words certainly were. Words come from inside where we really live. But, beyond this, and even more disturbing is the fact that Imus played to his audience and to the marketplace. His "shock jock" genre responded to a precise, scientific understanding of what those who listened enjoyed hearing. Imus had made such comments before. This time he picked the wrong group to attack. The community responded, thankfully. Advertisers read the writing on the wall. The networks fired him. Thank God for capitalism! When all else fails, money still talks. At least occasionally, it says the right thing. Imus is not the only one guilty of such foolish, mean-spirited, demeaning, racist pollution. But, he is the one we're talking about today. Surely, we can do better as a nation, as a people, can't we? As the controversy was boiling last week, I was reading Kurt Vonnegut's last book, A Man Without a Country, his brief autobiography. "Please tell me it will all be okay." Maybe Imus understood my generation and its inherent, genetic racism and sexism. Maybe that's what his marketing folks knew and so counseled him to be what he was. Maybe his entire mission was to market to the low road running through our souls. But, maybe, just maybe, we can face ourselves and simply decide to go a different way. Maybe the younger generation--people the age of my daughters and younger--will show us the power and beauty of simple human kindness. I don't know. But, I do know that we can do better. Baseball is back. . .finally! Though the weather hasn't been totally cooperative (Cleveland had a hard time getting their home opener done thanks to a spring blizzard! ), the boys are playing ball again all over the country. Call me over the edge if you like, but the return of baseball every year provides me a reason to hope. If you love the game, you'll understand. If you don't, at this moment you're thinking I'm nuts and there is absolutely nothing I can say to explain or justify my feelings. Maybe it is about my childhood. Maybe it is connected to the memories. I must admit I can still smell my old glove, the fresh grass and the ball on my hands. I can feel the heat. I recall the sudden excitement of a hot grounder headed my way or the crack of the ball against the bat. Baseball's back! I can read the box scores again over my Wheaties! I ask you now, could breakfast be any better than that? It doesn't even matter who wins, not ultimately. The joy is in the game, and not just the season. That's what makes baseball so unique, at least to people like me. Every game stands on its own. Doesn't matter who is playing. Sure, I yell for the Rangers every time they take the field. But the point is the game. The amazing plays, the strategy, the pitching. The game is about each game and the team. I confess: I grew up on the New York Yankees. Mantle, Maris, Berra, Ford, Richardson, Boyer, Turley. . .the list goes on and on. I still find myself pulling for the pinstripes, I can't help myself. Yankees versus Dodgers. . .Yankees in six! Hope to see ya at the ballpark! On a more serious note, today is Jackie Robinson Day for Major League Baseball! In every major league park in the nation today fans and players will remember number 42. On April 15, 1947, Robinson broke the color line for baseball when he took the field for the Brooklyn Dodgers in their game against the Boston Braves. The Dodgers won the game, played at Ebbets Field, 5-3. The white controlled press paid little attention to this first, historic game. During that first season, Robinson endured lots of insults, foul language and racially motivated hatred. The Dodgers' first series in Philadelphia against the Phillies proved the worst in terms of racial insults from both fans and players. It was during that game that Dodgers' second baseman, Eddie Stanky, a native of Alabama, came to Robinson's defense in a tirade that likely couldn't be published, even today! Branch Rickey, the Dodgers' General Manager who signed Robinson, later said that it was this series against the Phillies that brought the Dodgers together as a team. They came within one game of winning the World Series that year. Robinson scored a run in that first game to help the Dodgers on to a win. He wrote a column for The Pittsburgh Courier afterwards in which he said, "Whenever I hear my wife read fairy tales to my little boy, I'll listen. I know now that dreams do come true" ( "Breaking the Truth Barrier," Stuart Miller, The New York Times, Saturday, April 14, 2007, A27). Thank you, Jackie Robinson! The number 42 means a lot to baseball and to the United States today. My good friend, Richard Hughes, invited me to speak to students at Messiah College yesterday. So, I made the trip to Grantham, Pennsylvania, just outside Harrisburg, the state Capitol. About a year ago, Richard and Jan left Pepperdine University to direct the Ernest L. Boyer Center at Messiah College. Founded by the Brethren in Christ church in 1909, Messiah is a thriving liberal arts college with a history rooted firmly in Anabaptist tradition that includes an enduring commitment to social justice, reconciliation, peace and compassion. The students I met were special indeed. One group, the Boyer Scholars, is a select collection of seniors who were chosen to be set on a robust academic track while at Messiah. Boyer Scholars, in keeping with the philosophy of their namesake, are trained to appreciate the opportunities for social change and renewal that come through careers in education. Another group was preparing for a giant day of service next week in inner city Harrisburg. My stories about so many wonderful friends in Dallas seemed to be helpful to these young people who share a commitment to inner city renewal and redevelopment. Even though it was very short, I enjoyed my trip. A tip to travelers: this part of Pennsylvania is amazing. Important footnote to my sons-in-law: The river running through the campus is rated as one of the top 10 trout streams in the United States! I think I'll be back! Just about everyone agrees that the United States needs comprehensive immigration reform. Opinions vary widely on exactly what direction such reform should take. My experience here in East Dallas tells me that we need to find a ways to allow law abiding Mexican nationals to remain in the country, especially those who have been here for a long time. In my opinion we need a durable guest worker program that allows people to come and go for work. One creative and important piece of legislation that has been floating back and forth in the Congress for several years is the Development, Relief, and Education for Alien Minors Act, popularly known as the DREAM Act. The bipartisan legislation, co-sponsored in the Senate by Richard Durbin (D-IL), Chuck Hagel (R-NE), and Richard Lugar (R-IN) and in the House by Lincoln Diaz-Balart (R-FL), Howard Berman (D-CA), and Lucille Roybal-Allard (D-CA), addresses the situation faced by young people who were brought to the U.S. years ago as undocumented immigrant children, but who have since grown up in the country, stayed in school, and kept out of trouble. The provisions of this legislation speak directly to the situation facing my good friend, Monica (see my posts here on March 11 and 13, 2007). To qualify for immigration relief under the DREAM Act, a student must have been brought to the U.S. more than 5 years ago when he or she was 15-years-old or younger and must be able to demonstrate good moral character. Under the DREAM Act, once such a student graduates from high school, he or she would be permitted to apply for conditional status, which would authorize up to 6 years of legal residence. During the 6-year period, the student would be required to graduate from a 2-year college, complete at least 2 years towards a 4-year degree, or serve in the U.S. military for at least 2 years. Permanent residence would be granted at the end of the 6-year period, if the student has met these requirements and has continued to maintain good moral character. The DREAM Act would also eliminate a federal provision that discourages states from providing in-state tuition to their undocumented immigrant student residents, thus restoring full authority to the states to determine state college and university fees. Each year about 65,000 U.S.–raised students who would qualify for the DREAM Act’s benefits graduate from high school. These include honor roll students, star athletes, talented artists, homecoming queens, and aspiring teachers, doctors, and U.S. soldiers. They are young people who have lived in the U.S. for most of their lives and desire only to call this country their home. Even though they were brought to the U.S. years ago as children, they face unique barriers to higher education, are unable to work legally in the U.S., and often live in constant fear of detection by immigration authorities. U. S. immigration law currently has no provision for considering the special circumstances of this group of students. The DREAM Act would eliminate this flaw. No one can predict when the current contentious congressional debate about immigration will be resolved. Some predict that nothing will get through Congress until after the 2008 elections. Young people like Monica should not be made to wait for the entire debate to be resolved. Brought to the U. S. by their parents when they were just children, these young people should be removed from the debate. Those desiring to complete their education, serve this nation and become legal residents should be able to do so. If Congress fails to act this year, another entire class of outstanding, law-abiding high school students will graduate without being able to plan for the future. Some will be removed from their homes to countries they barely know. In the process the U. S. will lose a vital asset: an educated class of promising immigrant students who have demonstrated a commitment to hard work and a strong desire to be contributing members of our society. Support for the DREAM Act has grown each year since its introduction in 2001 during the 107th Congress. As of February 2007, the bill has garnered support from 48 Senate co-sponsors and more than 152 Republican and Democratic House co-sponsors. It has twice passed the Senate Judiciary Committee in bipartisan fashion, by a 16-3 vote in the 2003–2004 108th Congress, and again in 2006 by a voice vote without dissent, as an amendment to the comprehensive immigration reform bill. In May 2006, the DREAM Act passed the full Senate as part of the Comprehensive Immigration Reform Act of 2006 (S. 2611). It very likely also would have passed the House if brought up for a vote last year, but, unfortunately, the House leadership could not be persuaded to bring it up. Most observers believe that the DREAM Act has a better chance of enactment this year than it has ever had. It continues to attract bipartisan support and now for the first time also enjoys the strong backing of the House and Senate leadership and all of the relevant committee chairs. If you agree with the principles of the DREAM Act, contract your two U. S. Senators and your U. S. Representatives and urge their support for the passage of this important piece of reform legislation now. As you consider taking action, remember Monica and millions of young people just like her. During my recent visit to Seattle, Washington, I had the opportunity to tour one of the “tent cities” that works with local churches to provide temporary shelter for the city’s homeless population. I say “temporary” because the tent city campgrounds move every three months to a new church property where the community of tents is reassembled. The campground I visited was staged in the parking lot of a local Catholic Church. The migrant community had been there for almost three months and were beginning to think about the moving process. 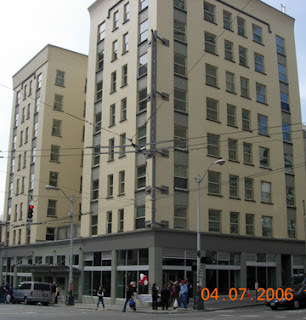 In talking to the residents, I learned several of the fundamentals of why these living arrangements were so attractive to the homeless, even in a city like Seattle that remains cold at night well into the summer months. The campgrounds are managed by the residents. The homeless who live in the tents establish and enforce the rules of the community. The living arrangement is all about being a helpful and supportive community of peers. No one is allowed to loiter within 1,000 feet of the perimeter of the encampment, unless at a bus stop or walking through the surrounding neighborhood to a job or an interview. People can basically come and go as they please like in any other normal housing situation. There are no enforced exit hours early in the morning, nor are there curfews at night. People have a place to stow their belongings during the day without fear that someone will steal them or throw them in the trash. There are plenty of bathroom facilities. The level of independent living possible here allows people to gain the “traction” needed to land jobs and save some money for a more permanent housing arrangement. No one here prefers remaining outside--a common myth held by the non-homeless. What they do seek is the freedom and independence of the environment. No one here wants to be hemmed in by the rules of others who don’t really understand what they are facing. No one wants to be forced to receive religious instruction. Respect abounds in this setting. Everyone is taken seriously, everyone pitches in and everyone is valued. I was amazed at the entire process. I was impressed with the church that extended simple hospitality to those who pitched their tents outside. I found hope in the place as I visited with the residents. Returning to Dallas, I wondered if such a plan would work here. I have my doubts, and that is a shame. I can think of a dozen churches right off the top of my head that would be great candidates for this sort of shared living arrangement. It seems clear to me that the churches involved here have found a way to “preach the gospel” without using a word! Frankly, I find that refreshing. Surprising facts: American donors and "the least of these"
A friend e-mailed me a link to Sheryl Sandberg's essay that appeared in The Wall Street Journal recently ("The Charity Gap," page A15, April 4, 2007). Sandberg's findings stood over against what most of us believe about American charitable commitments and concerns. Whenever American donors are asked, we report back the belief that most of our donations go to assist those less fortunate than ourselves--right? However, the facts of our giving tell a very different story. Sandberg's report cites a study underwritten by Google.org that reveals less than one-third of the money individuals gave to nonprofits in 2005 went to help the economically disadvantaged. "The analysis, carried out by the Center on Philanthropy at Indiana University, concluded that only 8% of donations provide food, shelter or other basic necessities. At most, an additional 23% is directed to the poor -- either providing other direct benefits (such as medical treatment and scholarships) or through initiatives creating opportunity and empowerment (such as literacy and job training programs). It's just not true, in other words, that the major beneficiaries of charity and philanthropy are the disadvantaged," Sandberg reports. Among wealthy donors the gap affecting the very poor is even wider. Those earning more than $1 million per year give only 4% of their donations for basic needs and an additional 19% to other programs geared toward the poor, even though they also report when asked that most of their donations go to assist the poor. The role of individuals in American philanthropy is often misunderstood. Individuals give more than four times as much as foundations and corporations taken together. Here's an amazing fact, according to Sandberg's report: fewer than 10,000 American families contribute more than 20% of all donations. Sandberg provides some interesting analysis as to reasons behind these trends. I found her comments on church giving to be instructive, but not so surprising. When I drop my check into the offering plate on Sunday morning, I may have in mind my congregation's outreach to the homeless, but the fact is less than 20% (in most churches far less) of every dollar given in church benefits the poor in my community or anywhere in the world. For individuals and families earning below $100,000, church giving accounts for the majority of gifts offered up. Really wealthy donors target education and health care in their giving. Sadly, less than 9% of these dollars go for scholarships to low-income students and only about 10% supports health care initiatives for the poor. Sandberg concludes, "As Americans consider their 1040s this year, they need to ask if there is a disconnect between their desires and their actions. Many will find, perhaps to their surprise, that what they want to do is not, in deed, what they're doing. If so, they should start looking deeper into how their donations benefit those whose economic fortunes are dramatically different from their own." [Ms. Sandberg is vice president of global online sales & operations at Google Inc. and a board member of Google.org. present their plans for fighting poverty in Dallas! April 26, 2007 at 7:15 a.m.
A cup of coffee. . .
She was standing, better, lingering in a focused hover over the coffee bar in the hotel where I spent two nights in Seattle recently. It took me a moment before I realized that she was homeless. The grime of the street worked out of her pores. I noted abrasions on her hands. Her bright red lipstick dominated her face, outlining her easy, but tired smile. She maintained a dignified, but rumpled look. She was extremely deliberate in preparing her morning drink. She took her time, preparing the coffee in the positive environment where she obviously felt comfortable and welcome. “Why is it that the older you get the faster time seems to fly by?” she asked no one in particular. She finished her fixing her coffee, as I began to prepare mine. She picked up her bag, waved to all present in the lobby and said, “I hope you all have a grand day!” And she was gone into her day. The hotel staff at the registration desk seemed neither to notice nor to mind that she had invaded the hotel’s private and commercial space to pick up a cup of coffee. For some reason I can’t get this experience out of my mind. I realize it is just one incident. It is anecdotal from start to finish, no serious or exhaustive research here. But, I will always believe that what I observed in that hotel lobby provides commentary on the “soul” of the city we refer to as Seattle. I can’t help but wonder what this woman’s experience would be in a downtown hotel here in Dallas. I’m sorry to say, I don’t think she would fare as well in our proud city of big churches, faithful people and dynamic businesses. As big as we are here, at times I get the feeling we just don't have enough space for this sort of ordinary kindness and mutual respect. Life presses on us circumstances, pain, defeat, fear and doubt at such a depth and pace that without hope we find no reason whatsoever for going on. But, hope lives among us. Or, if it doesn't at this moment, it can be reborn. Years ago it became very clear to me that if a child has hope, she will learn to read at grade level, no matter what other factors in her world may be out of whack. Everything may not be perfect. A world full of fear and challenge may surround the child, but with hope, great things are not only just possible, they are within reach. I've observed much the same thing in the eyes of my homeless friends. A basic hope in what is ahead keeps the most challenged life moving on with a sense that better things are ahead or could be. Life hard wires us for hope. Hope fires the poorest church in the inner city. Hope knocks the single parent out of bed every morning and sends her into another day of hard work, as she thinks of the better life her kids will enjoy. Hope moves people all over the world to find and to carve out a better life, a better world. Hope makes acts of great risk and courage feel routine. Life teaches us all about the power of darkness, doubt and despair. Easter calls us back to hope. Darkness does not have, cannot have the last word. Death surely will not win out. Life prevails. And, even here, no matter what, hope lives! If I were preaching on Easter. . . I've been wrestling with Jesus for almost 50 years. I mean, the guy has this way of getting all over you, under your skin, moving inside your head and never letting go! The longer I have studied, listened to and observed him in the biblical record, in terms of his historical impact and in regard to the effect he has had on my own life and world, the more convinced I am that most people don't really understand him, what he said or who he was. Jesus didn't talk much at all about church things. He didn't provide much instruction on worship services or music styles. He wasn't into institutional matters. In fact, he chaffed against the institutional leaders and voices of his own day. In my experience he continues that same tact today. Jesus didn't talk about ordination or education or anything related to status in positive terms. He talked about life. He talked about this world, its pain and how he wanted to open folks up to a new way of navigating their way through this life. He connected the here-and-now of my life to the there and then of the next life. So, if I were preaching this Easter Sunday (and, to the relief of so many, including myself, I am not! ), my sermon would be a bit different than it was 15 or 20 years ago. I would be pointing beyond the particulars of the resurrection narrative to the significance of the story, the claim and the man, as each relates to the real world in which I live today. What, after all, is the power of the resurrection story for my world? The resurrection story declares that death will not have the last word and that life beyond this life is certain. But, remember, this is a story about a person who dies, passes over and then returns. This movement toward this world is very important, or so it seems to me. If my afterlife is squared away, I am free to concentrate on this world--its beauty, its ugliness, its pain, its joy, its need and its assets. If I truly believe in the truth back of Easter, I am not carried farther away from this world. To the contrary, Jesus shows me that I am pressed deeper into it and its messiness. So, my one-point message would be simple beyond belief. To celebrate the resurrection, to signal your belief in its power and its truth, be a resurrection in your world! Live your life as an agent of resurrection, life, renewal and hope. That's what I'd just have to say. 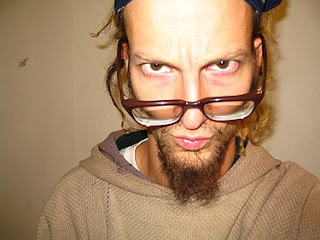 We've talked a bit about the thought and work of Shane Claiborne here in the past. Claiborne's cage-rattling book, Irresistible Revolution: Living as an Ordinary Radical, has set off lots of discussion in the Evangelical world of Christianity. "Shane Claiborne is a living experiment--evangelical zeal mixed with grassroots activism; passion for Jesus mixed with prison time for feeding the poor. This is a rant for love, aimed at cowards seeking courage." If you live in Dallas and if you'd like to hear him in person, then plan on being at the University Park United Methodist Church (4024 Caruth at Preston Road) on Monday, April 9 at 7:00 p.m.! Not surprisingly, Shane's presentation for the evening sports a provocative title: "Jesus Wrecked My Life." Should be quite the evening. . . maybe I'll see you there. 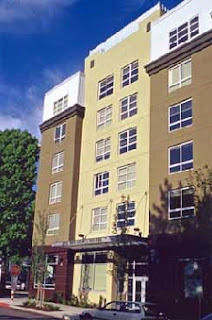 Thanks to the Corporation for Supportive Housing (CSH), I spent Monday and Tuesday of t his week in Seattle, Washington with a group of housing developers from Austin, Dallas, Fort Worth and Houston. CSH organized the meeting so that we could "go to school" on Seattle's 10-year plan to end homelessness. For this city ending "chronic" homelessness--the national goal, is not enough. This community intends to wipe out homelessness of every type. As a matter of fact, I sat in on a community task force meeting where it became clear that the group's goal is to eliminate all shelters in the city by 2015. 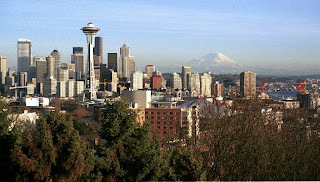 As might be expected, Seattle's plan is bold, comprehensive, unrelenting and clear. The results to date have been remarkable. Working together, the city and its housing partners have produced thousands of new units for formerly homeless persons. A couple of aspects of their strategy stand out. For one thing, they have identified the most expensive homeless persons in the city--those who make frequent visits to emergency rooms, end up in the criminal justice system time after time, depend on shelters and use large amounts of other community services due to their homelessness and associated problems. By targeting this subset of its homeless population and by investing strategically in these men and women, Seattle is on a track to saving the community millions of dollars. Most remarkably to our Texas group, the citizens of Seattle have voted four times--count 'em--four times to tax themselves to insure that the poorest persons in the city are cared for and directed toward lives of self-sufficiency and productivity. As a result of this community-wide commitment and smart leveraging of this consistent funding source, the City of Seattle is able to spend $40 million annually on housing development! I left the city inspired and sobered. I'll post again about what I perceived of the "spirit" of this very special community from just one person I observed in the hotel where I stayed. Dallas needs to build on the recent success we've managed around our new Homeless Assistance Center. But our goals going forward should focus primarily on the development of high-quality, permanent housing for the poorest people in our community. We can and must do much better as a city. Sanitation workers, MLK, memory and mission. . .
"just like a penthouse. . ."